Shirley Parsons loves to put her grandchildren, Judah & Elena, through their paces! Many notable Colorado Juniors enjoy long and successful careers in the sport, and the CRA supports them in many ways – from new player programs, coaching and instruction, to scholarships and travel funding to major events. But long before that, CRA Board members aid in developing the next generation of players – with JUNIORS 101 – a comprehensive 12-page reference outline containing tips, tests, drills, diagrams and a pull-out poster to help promote your local progam. Looking for an activity for youngsters that develops eye-hand coordination, agility, quickness, is a high calorie burner, and always lots of fun? Racquetball is your answer! Kids can quickly learn the rules and develop skills that will get them playing games in as little as two days. As a parent or teacher, you don’t need to be an expert (or even know how to play yourself), because the Colorado Racquetball Association will help you get started. We’ll act as a liaison between you and the nearest court club, where a class or clinic can be designed to fit your needs. 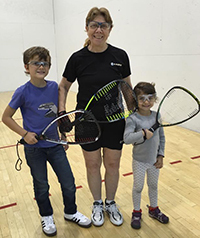 Most racquetball facilities encourage the development of junior programs and are looking for groups to utilize the courts in non-peak hours during the day, early morning, or early afternoon. We can help by contacting local health clubs or recreation centers for you, finding an instructor to get you started, and supplying equipment. Please contact Dan Davis to get into the pipeline! The CRA is so committed to helping you create a successful junior program at your facility that, along with the JUNIORS 101 start-up kit, we’ll also provide racquets and eyewear. Whether you need a weeklong camp session or a 90-minute clinic, CRA has a variety of strong programs and expertise to draw upon – and we’re happy to share our resources. All you need is a commitment to work with kids to learn a sport that they can enjoy for a lifetime. Start today!